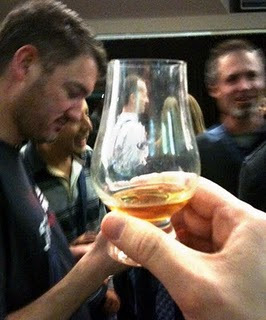 It's Whisky Live Sydney 2010 round up time and I thought follow up my post from the other day about attending the event to what I thought about the event now it is over. Other members I am keen to hear your own interpretations. Overall a good evening was had by all though I think general opinion from the group was an unimpressive show up by distilleries. Is this is a prelude to how the whisky worlds marketers are seeing Australia? Is this the best it is going to get on our store shelves...? Maybe. The night started for some of us with a meet up at the local pub for a hearty meal and a beer followed by a short de-carb and fat walk off to the event. Standing at the door there was a meager turn out of individuals (maybe 110) waiting for entry (where there going to be others arriving soon? Did they know something we didn't?)...? Probably. Entry was quick with a couple of security chaps at the door (good to see and appreciated as it set the mood not to get messy) and a hand me bag with a bottle of water and tasting glass inside (more water please and maybe some documentation). Rushing in we are hit with a relatively vacant arena, a few growing crowds towards the Talisker stand and a few too many confused people asking "Where are my x10 tasting vouchers?". It turns out no vouchers were issued and you could taste whatever you wanted however many times you wanted. Sounds great no? In one way yes but in another for me I felt a little let down as I no longer really had to be choosing the whiskies I really wanted and ask all the right questions before I tasted. None the less onwards and upwards. Like many the club members quickly did a scout around and then congregated at the Talisker stand. It turned out very quickly this was the best it was going to get (no joke). Not to many big brands were represented and that is fine but the tasting on offer by others was generally poor and maintained by ring-in reps or even bottle-shops themselves serving multiple brands with no clear knowledge about any of them. All too often I found the rep touted the stand info already printed on a cheap facsimile facts sheet in front of me and after that some vague pieces of trivia. Many knew nothing and even admitted to it. The US distiller 'Jefferson's' was apparently a listed 'highlight' of the tasting yet on finding the tasting stand it was maned by an individual whom I quote said "Honestly I only tasted this for the fist time this morning and I know nothing about the product. I am not hear to represent Jefferson's but rather I am representing myself and my business". In saying that he then proceeded to not even tell me what his business was and started pouring something else into someone else's glass without a blink. So sad. Stands I felt were poorly stationed with presentation simply crap in in most cases. Do I really want to be tasting from a stand where the rep looks like he has been sleeping in the gutter the night before? No. Again this all points back to Talisker. Well stationed stand with staff that tended to know their stuff a lot better in suites and ties and quick clearly clean shirts. 3 expressions on offer and a constant purchase of a bottle or two flowing from exhibitor to attendee. Yes this is turning into a bit of a gripe but it should also be pointed put that the food was great but only when you could get it. Imagine 30 hungry wolves and a single plate of x8 small bowls being placed on the table at any one time. Yes this is exactly how it was. Delivery of the food was sparse with individuals like myself foolishly waiting 20min and nothing to arrive. After a pissed off period of waiting I promptly tracked down someone whom had an 'event organiser' badge on and complained about how poor the service was, only to be rebutted with the comment "There is no more food as it was only to be available for 2hrs". Looking at my clock the event had only been going 1 1/2hrs. Was my complaint heard, I doubt it, but I think there was one too many others with the same intention and in about 45min another 3 or 4 more plates arrived (after I noticed they were offered to all the stand operators first) and then that was it. Highlights for me was the Makers Mark stand. Though the rep appeared to be a knowledgeable Makers Ambassador it was also a stand for Beam in general and that was actually good as there was many items I have always wanted to try. Best of all was the opportunity to taste a makers Maker New Spirit bottled within an hour of distillation. WOW. It tasted like corn lolly water with not a a hint of alcohol. Dangerous! Apart form the Talisker stand this was the only other stand the rep actually felt passionate about his job and knew his stuff. Bravo! By about the 2hrs mark my taste buds were wasted. I could not taste anything anymore and was skulking about the beverage vendors Duvel (Nice beer by the way) for a beer breaker to try and kick start things again with little results. With no food, no pallet cleansers, and water running out quick my night was finally shot. Overall was I happy to have gone? Yes. Will I go again? Yes, though with reservation if it is like this one again then not again for a while. I tipped a hell of a lot of whisky down the drain that night. A hell of a lot indeed. OK so you cannot control whom decides to exhibit at the event nor even how they choose to present themselves but the event organisers have a hell of a lot to answer for. Truely it was absolutely a poor performance and when an event is managed this badly you can see why the big players may well be staying away. I could say more but really do you want to hear it? If I was to give a rating for the event then it would be 3 out of 7 and if I was to give a rating on the whiskies on offer then certainly 2 out of 7. I can only imagine Whisky Live Taipei (held on the same night) was well ahead of this one.